Re-live the magic of Viola Day 2015! If you would like a copy of any of these pictures, or if you have pictures of your own that you would like included, please contact me and I’ll be happy to send you what you need! Enjoy! Thank You to everyone who helped to make Utah Viola Society’s Viola Day a success! Thank you to each and every one of you who attended Viola Day as a violist, a student, a performer, a parent, or just a fan of the viola! Thank you to our sponsors, Season Sponsor Scoggins & Scoggins Violin Shop and Event Sponsor Summerhays Music! Additional thanks to Adam Day Violins, Dan Salini, and Lawrence Furse for bringing their instruments, thanks to Brant Bayless for showing us how great those violas can sound! Thank you to all the students who performed beautifully in the masterclass for James Dunham, you’re all making Utah look good! Thank you to all the groups who performed in the Ensemble recital, you all rocked! Thank you to everyone who participated in Violapalooza, and thanks to Dr. Robert Baldwin for leading us in such a fantastic performance! Thank you to the University of Utah for the most perfect place to have Viola Day, and thanks to Utah State University for their ongoing Viola Day support!!! Check out the Utah Viola Society’s YouTube debut! That was so much fun! Thanks to everyone who participated!!! Michael Kimber’s Violapalooza and many of his other scores for viola solo or viola ensemble can be found on his website. I just want to say a loud and clear THANK YOU to everyone who has responded to our membership drive! THANK YOU!!! From the bottom of my alto range heart, thank you! Membership is a Bargain. Yes, a Bargain with Capital B. We can’t be a healthy and vibrant viola society without members. Without members urging us forward we can’t challenge ourselves to bring you the kinds of Viola Days and Viola Weekends that all of us want to be part of. Thank you so very much to those of you who have joined the Utah Viola Society. You can pay dues online or send a check. We’re not picky. You don’t even have to be a violist to join, if you love the viola or love a violist that is reason enough! Signing up in advance will get you through the line quickly at Viola Day, and you’ll have more time to spend looking at instruments or chatting with viola friends. If you want to wait until the event to join, you can do that, too! We will be able to take cash, check, or credit card. We look forward to seeing you next Saturday!!! October Viola Events – Full Schedule! Here is a full schedule of our upcoming activities. All events are free to members of the Utah Viola Society! Becoming a member of the Utah Viola Society couldn’t be easier! 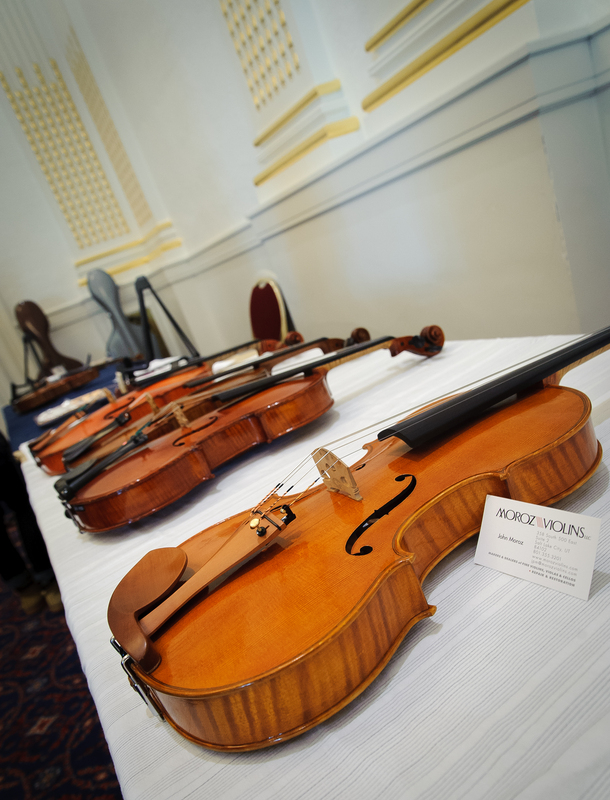 Follow this link if you love attending viola events, hearing about recitals, getting together with your fellow violists, and staying connected with all the violists in Utah. The best way you can support us is to join Utah Viola Society today. Your membership helps us continue to present masterclasses, recitals, and all day viola events. 12:00 Pizza Party and social hour – visit our vendors, play their lovely violas, eat some pizza, meet your local viola idols, and hang out with your viola friends! 1:00 Demonstration of local instrument makers by Utah Symphony Principal Violist Brant Bayless, then try more violas! Locally made, locally played! Sunday 10/25, 6:00-8:00 PM. Chamber Music Masterclass with James Dunham, viola, and Paul Katz, cello. Chase Fine Arts Center, room 214. Monday 10/26, 4:30-6:30 PM. James Dunham, Viola Masterclass. Caine Performance Hall. Tuesday 10/27, 7:30 PM. James Dunham performs the Brahms F-minor Sonata with Pei-Shan Lee, piano, followed by the Brahms B-flat String Sextet featuring the Fry Street Quartet, James Dunham, and Paul Katz. Caine Performance Hall. Be a part of the Viola Ensemble Concert during Viola Day 2015 – form a group with your students, friends, or colleagues and take the stage! We will also be organizing a massed performance of Michael Kimber‘s brilliant “Violapalooza!” as the grand finale. Everyone can take part, and you won’t want to miss it. If you would like music in advance to rehearse with your group, or to practice on your own, contact Brad here. If you haven’t done so, please update your Utah Viola Society Membership today! Viola Day!!! 2015 is two weeks from today! 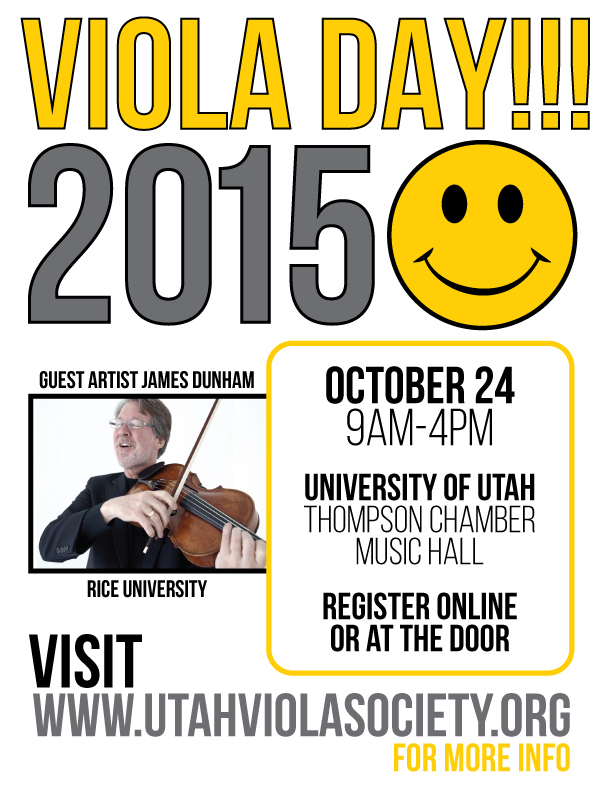 Two weeks from today the Utah Viola Society will hold its Viola Day!!! 2015. Our special guest this year is James Dunham, former violist of the Cleveland String Quartet and current Viola Professor at Rice University’s Shepherd School of Music. Please consider renewing your membership today! Your membership allows us to continue to put on our fabulous recitals, classes, and day-long viola events. 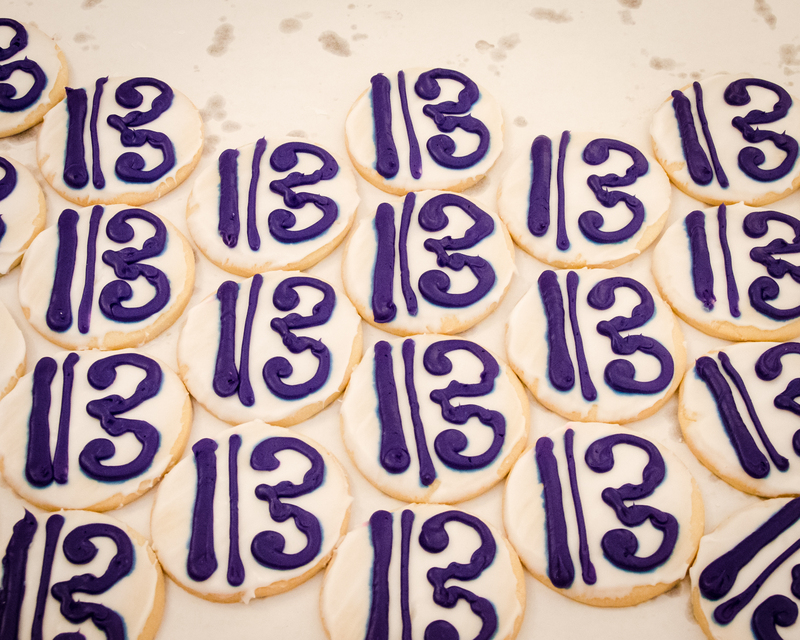 Plus, as always, alto clef cookies! Need I say more??? In the meantime, in preparation for Viola Day, here’s an interview with James Dunham, courtesy of the American Viola Society!